Traffic was so bad that walking seemed like the most sensible thing to do. I could have stayed after college in Metro Manila for better personal economic gains. That I returned to Lipa for much humbler remunerations than I could have expected in the Big City was partly because I hated two things about the place: the climate and the seemingly perpetual state of gridlocked traffic on the roads. There is stark irony, therefore, in that just over three decades after I graduated from college, the very traffic that I avoided like the plague has sought me out in my home city of Lipa. Yesterday’s state of affairs on the roads, for instance, has got to be one for the record books. Traffic in the city has been worsening exponentially in recent years, exacerbated during the holiday season because of Christmas shopping and merrymaking. This season is also the time when expatriates return home to spend time with family and friends; and thus the city’s population is temporarily inflated. So yesterday being a Friday and the last school day of the year, people were understandably heading home for the weekend from elsewhere or wanting to go to the malls for last minute shopping for Christmas parties or whatever. I was aware of this. Thus, I left home before nine – earlier than I usually do – to pay the month’s credit card bill. Most days, there is a window between 8:30 in the morning until about 9:30 when the flow of traffic from Fernando Air Base to the Batangas-bound gates of the STAR toll way is reasonable. Any later and the traffic starts to slowly build up. The flow was still reasonable. Hence, I felt that I had time to stop for breakfast at the Jollibee store in Tambo. That brief stop probably cost me. I took my ride at just past nine, but nearing the Manila-bound gate of the STAR toll way, traffic started to slow down to a crawl. Oft-criticised DLSL was not the problem at all; although the first choke point was the U-turn slot close to the gate of its new building. The main culprit was the mouth of Altamirano Street near McDonald’s where vehicles coming from the J.P. Laurel Highway and those from Morada Avenue were jockeying to get entry. There was more jockeying at the corner of Altamirano and M.K. Lina Streets where vehicles coming from Lodlod and Ibaan joined the merry mix of vehicles all trying to get to the Poblacion. It was so bad that it came to the point where if the vehicle went 20 yards without stopping, one somehow felt happy. The final choke point was the U-turn slot by the C.M. Recto Monument in M.K. Lina Street of the Poblacion. When I got off my ride to walk the short distance to the bank, I checked my watch and was not surprised at all to see that it had taken me all of one hour and fifteen minutes to get there from Jollibee. It took me two minutes to pay my bill so there you are in summary – a one hour and a half trip to conduct a two-minute transaction! That, ladies and gentlemen, is how life has become not just in Lipa but in many cities in the Philippines. We spend so much of our lives being unproductive due to circumstances we neither desire nor create. 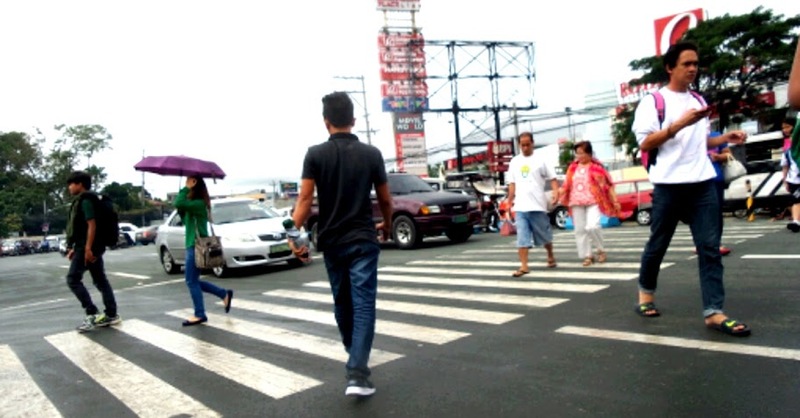 I still had to go for groceries at Robinson’s Supermarket; but seeing as I did that vehicles were barely moving along Morada Avenue, I decided that the most sensible thing was to walk to the mall. I do love walking and it was also a rare opportunity to burn off some calories in what has of late become a sedentary lifestyle. In front of the Cultural Centre, armed police and a large tarpaulin announced to all and sundry why the C.M. Recto Monument U-turn slot was such a catastrophe: Mar Roxas and Lennie Robredo were expected. I do not think that such a political event would have caused traffic in itself. Rather, it was the timing of it. If it is any consolation at all, the two likely had to suffer the traffic as much as you and I had to. I also learned, albeit not something I have personally verified, that Governor Vilma Santos-Recto was distributing rice somewhere. If true, then same remark. The timing of it would have contributed to the convergence of people in Lipa. Just because the roads were so screwed up yesterday, my trip home took all of 45 minutes, twice the normal. Lipa-bound vehicles hogged three of the four lanes of the highway from Tambo to the front of Fernando Air Base. The unplanned procession, can you believe it, snaked all the way to the new Toyota building in San Vicente. On Facebook, I learned that if anything, I got off lightly because I was the early bird. Those who set out later suffered worse than I did. One took all of two hours and 10 minutes to get from Sabang to Poblacion. Another said two hours from Tambo to Poblacion. Finally, another one said he took one and a half hours to get from DLSL to Poblacion. Things will naturally normalise as soon as the Christmas rush is over; but even normal these days, in Lipa, is still far too congested compared to what it used to be. It is all well and good that economic upsurge in this country has meant that more people have been able to afford vehicles. Meanwhile, the infrastructures and services like modern mass transportation have not kept up. The traffic problem in Lipa is localised, yes; but its solutions are at the hands of national government. Infrastructures and modern mass transportation systems have to be accompanied, among others, by effective population control and legislation to control the ownership of vehicles. The solutions, if at all there are any in the Philippine context, are really for another article altogether. Meanwhile, it cannot be right that one dreads going to Lipa because traffic can be such an unwelcoming phenomenon.